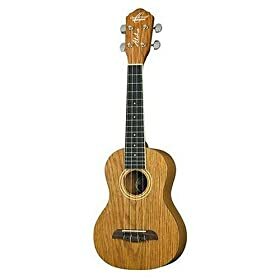 Musicians Gear Featherweight Soprano Ukulele Case . From the description, "This Durafoam uke case offers the same protection for your soprano ukulele minus the heft. The high-density polystyrene foam shell has a soft plush form-fitting interior that coddles your instrument and is covered with tough Cordura." It sure sounds like I'd rather be hauling this case through the airport than something that I'm sure to jam into my legs when I'm juggling 6 things trying to show them that I don't have more than 10 ounces of liquids or gels on my person.